If you have a love-hate relationship with Thanksgiving, you are so not alone. Many of my clients say they love it because it’s a chance to relax, eat yummy food, connect with family and friends, and reconnect with gratitude. And yet, it’s all of the relaxing, eating, and socializing that also stresses them out!! I’m here to tell you that the problem isn’t food. And the problem isn’t you. The problem is that you have been brainwashed by diet culture. I’m going to offer you 5 tips to help you enjoy the ultimate food holiday a little bit more and stress a little bit less. 1. Eat food before your feast. Growing up we seemed to eat Thanksgiving “dinner” around 3:00 pm. This just seems so random to me. A giant meal in the middle of the afternoon – I don’t understand this tradition. But regardless of when you eat your main meal, make sure you’ve had a full breakfast and a sizeable snack as a bare minimum. When we show up starving to a meal with tons of super yummy options, we tend lose our head a bit. None of us think rationally when our brain is starved. We can thank evolution for that one. It’s not you, it’s the cave people who came long before us. 2. Prepare your responses to your diet and weight-obsessed family or friends ahead of time. I bet you can anticipate what some of those people might say. 3. Spend a hot second talking with yourself. I created a set of 9 journaling questions in last year’s Thanksgiving post that may be useful. For clinicians reading this, you could consider talking through these questions with your clients. 4. Commit to pleasure. Does that make you feel terrified? In the U.S., pleasure has become synonymous with gluttony (you know, one of the seven deadly sins?). This is diet culture and it’s messed up. Think of pleasurable eating as tasting good in the moment while leaving you feeling physically well after the meal is over. The “get it all while you can, I’m being bad today” mentality is a dieting relic. If you give yourself permission to eat with pleasure every day, you’ll notice that these “special” eating days become less stressful. If you are interested in registering for the Online Eating Disorders training program, be sure to sign up before November 27th and save 10%. 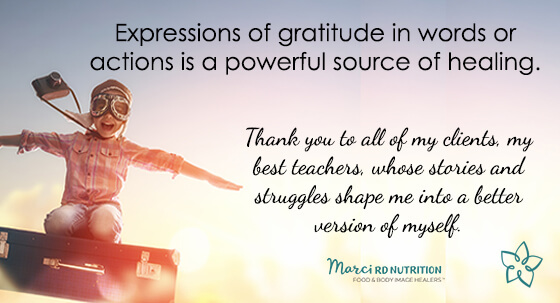 Visit marcird.teachable.com and use the code: FNCE2017 at the check out.